Based on a design pitched by a kid entrepreneur, this homerun mug will be a hit with your little slugger. Step up to the plate, or rather, mug with this home-run design by Max, a young entrepreneur and sports fan. Sure to score big with little leaguers or grown-up fans of the game, this grand-slam idea encourages everyone to play with their food. 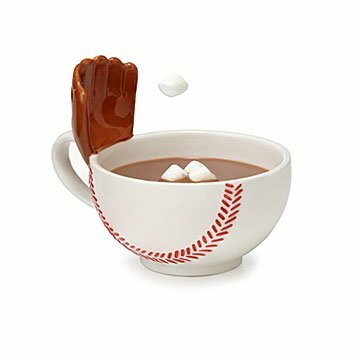 The oversized cup is shaped like half a baseball, and the handle sports a mini-glove to catch marshmallows for cocoa, crackers for soup, or toppings for ice cream. Made in Thailand. Make it a collection with The Mug with a Hoop, The Mug with a Goalpost, The Mug with a Goal, and The Mug with a Net . Came quickly and like the quality. It's adorable. Giving it to him with Mets baseball tickets for his birthday. Intend to get the basketball one when the season starts again in the Fall. Otis absolutely loved it. His mother told me he wants to eat every meal in it and will not accept any other dinnerware. He is 3 years old and LOVES baseball. It is a great kid gift and will be enjoyed by them for many years. Super cute for my baseball hero. I hope that my grandson, whom is a crack baseball player, likes it! Great gift for a baseball fan ! This was perfect for the man who has everything baseball. He didn't have this. A new twist for breakfast that he thoroughly enjoys. As cute as it looks in the photo. Larger than I thought it'd be, more bowl than mug. Wasn't there when the gift recipient opened it, but it was a hit with others who saw it before I sealed it. Bought this as a gift for someone who loves playing and watching baseball. The mug is a great size for tea/coffee/hot chocolate and can also serve as a small bowl for oatmeal or cereal. The design is great and adds fun to whatever its being used for! He liked it very much. He told me it was not as big as I thought it looked like in the picture. We were hoping for a large bowl like cup that he could eat one huge bowl of cereal out of but he said he uses it 3 times for cereal! LOL!